Summary Four-bay RAID5 class NAS with dual Gigabit Ethernet ports and built-in 10GbE SFP+ port. Powered by dual-core Annapurna Labs CPU. 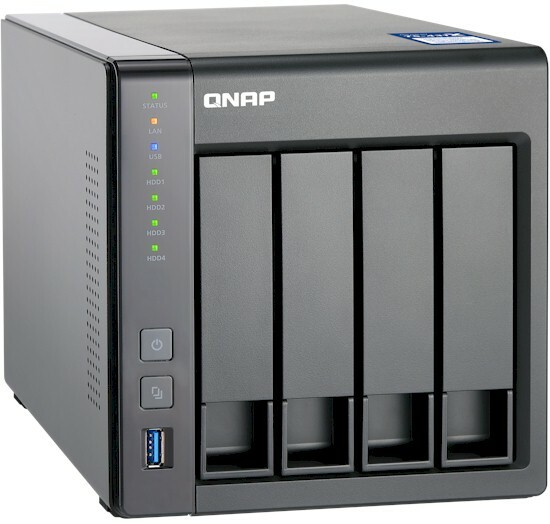 Recent reviews of QNAP products have covered the four-bay TS-431P and its two-bay sibling, the TS-231P. Both of those products are part of QNAP's "Home-middle range" product lines. The next step above that category is a fairly recent addition by QNAP - the "Entry-level SMB" category. For this review, we'll be focusing on the TS-431X. The chart below shows that it's very similar to the TS-431P, with both using the same Annapurna Labs processor clocked at 1.7 GHz. The two main differences are the amount of memory and the built-in 10 GbE SFP+ port. The TS-431X is available with 2 GB (TS-431X-2G) or 8 GB (TS-431X-8G) of DDR3 RAM vs. a non-expandable 1 GB on the TS-431P. QNAP sent the TS-431X-2G for review. The chart also includes the QNAP TS-563, which we'll be using to compare 10 GbE performance. The TS-563-8g (reviewed) has a quad core processor and 8 GB of RAM, compared to the TS-431X's dual core-processor. So we might expect to see some large performance differences. The callouts below show the front and rear panel of the TS-431X. There's a single USB 3.0 port on the front panel located just below the One Touch Copy button. The rear panel has two Gigabit Ethernet ports, one 10 GbE SFP+ port, and two additional USB 3.0 ports. The photo below shows the component side of the board. The CPU is covered with a large heat sink. In the lower right corner, there's a connector for the riser card for the drive backplane. The table below summarizes the key components for the TS-431X, TS-431P and TS-563 I'll be comparing later in the performance section. Note the 10 GbE port connects directly to the AL-212 processor; no 10 GbE PHY was required. Power consumption with four SNB-provided WD Red 1TB (WD10EFRX) drives was 22 W (active) and 13 W power save. Fan and drive noise was rated as low (mostly drive noise). As we pointed out in our review of the TS-431P, QNAP NASes share a common operating system, whose latest version is QTS 4.3. You can read or download a comprehensive brochure here. QTS 4.3 continues QTS 4.2.2's look and feel with some minor visual tweaks. You still can't resize many of the windows, whose default width is more than 1024px. The screenshot below shows the "hamburger" menu and dashboard flyouts exposed.